Lou Mannarino, live audio engineer for the New York Philharmonic and CEO of L&M Sound & Light, recently expanded his company's inventory with the addition of an L-ACOUSTICS KIVA system, which has already been deployed on a number of high-profile events throughout the Big Apple. L&M took delivery of 18 KIVA line source elements, six KILO low-frequency extension enclosures, eight SB18 subs and a quantity of LA8 amplified controllers in December of last year. The first production to utilize the new gear was a Pirelli event featuring Italian tenor Andrea Bocelli and staged at the historic Park Avenue Armory's 55,000-square-foot Wade Thompson Drill Hall. Mannarino also used his system for the New York Philharmonic's recent spring gala, Anywhere I Wander: The Frank Loesser Songbook, at Lincoln Center's 2,800-seat Avery Fisher Hall. With a full 140-piece orchestra backing up a "who's who" of Broadway performers, the engineer chose to fly an LCR system made up of three arrays each comprised of two KILO and six KIVA. Two SB18 subs provided additional low-end reinforcement, while three self-powered 108P coaxials delivered front-fill. 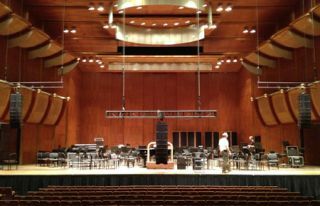 "I've used just about everything in Avery Fisher Hall over the years, but the performance of the KIVA-KILO system was so superior to anything that I had ever done there," he says. "The hall has three tall tiers above the raked orchestra seating, so it's a very challenging room, but the sound at the spring gala was so ubiquitously intimate and transparent--never obtrusively drawing the audience's attention away from the guest vocalists onstage. It was only toward the end of the show when one microphone produced a tiny bit of noise that I think anyone had a clue that a PA was even being used. It sounded that natural. "The system was also every bit as dynamic as the orchestra, which can jump from total silence to 95dB in an instant. Trying to make vocals intelligible when the whole orchestra is performing at fortissimo is typically not an easy task, but the L-ACOUSTICS system helped them cut through so beautifully." Mannarino notes that he appreciated the performance characteristics of the KIVA system off-axis. "I found that it handles off-axis as gracefully as on-axis," he says. "When you step outside the coverage area, the tonal properties aren't altered--only the volume. The sound is still just as delicate, articulate and musical, which is fabulous." Although L&M's founder and CEO had previously been familiar with V-DOSC and dV-DOSC, it was his experience at a 2011 Taylor Swift concert at Madison Square Garden that convinced him to invest in his first L-ACOUSTICS system. "Sound Image's K1 and KARA rig sounded absolutely stunning," he says. "It was the best sound that I had ever heard in the Garden, so I started looking into L-ACOUSTICS' smaller systems. "I actually ended up purchasing KIVA without ever hearing it, but, because of L-ACOUSTICS' reputation, I wasn't worried. And I'm thankful that I made the decision because the system truly outperforms both the published specifications and what I had expected. Being able to drive KIVA as a creative tool in the marriage of musicality with the New York Philharmonic and other clients is overwhelmingly satisfying."